- AJW Budokan Hall (August 22, '85) = Monster Ripper defeated Yukari Omori. - AJW Dump vs. Chigusa "Hair vs. Hair" (August 28, '85) = Monster Ripper fell to Lioness Asuka. - AJW The Best Tag Team League '85 (October) = Monster Ripper & Monica Castillo competed in the league, which was won by Dump Matsumoto & Bull Nakano. 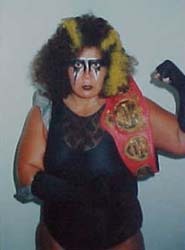 - WWC 17th Anniversary Show (July 7, '90) = Monster Ripper won the WWC Women's Title, taking down Candi Devine. - WWC 18th Anniversary Show (July 6, '91) = Monster Ripper beat El Profe. - AJW Wrestlemarinpiad III (November 21, '91) = Monster Ripper & Bull Nakano fought to a No-Contest in a "Steel Cage Texas Death" Match with Aja Kong & Bison Kimura. Later, Monster Ripper lost a "Steel Cage" Match to the WWWA Champion, Bull Nakano. 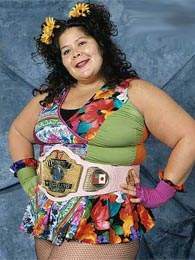 - WWF Summerslam '95 (August 27) = Bertha Faye won the WWF World Women's Championship from Alundra Blayze. - WWF Survivor Series '95 (November 19) = Faye, Aja Kong, Tomoko Watanabe, & Lioness Asuka won an "Elimination" Match over Alundra Blayze, Chaparita Asari, Sakie Hasegawa, & Kyoko Inoue. - Stampede Stu Hart Tribute Show (December 15, '95) = Rhonda Singh defeated KC Houston.